I am sure that it comes as no surprise to all of you that I like to watch the Food Network Channel :-). My favorite show right now is Chopped – I love it, but I also like to watch Barefoot Contessa and the other more traditional cooking shows. Anyway, I turned on the TV the other day, while I was making dinner, and the show Diners, Drive-Ins, and Dives was on, and they were featuring a BBQ place that was serving Redneck Tacos. I wish I could remember the name of the BBQ restaurant, or even which city it was in, so I could provide better credit for the inspiration behind this recipe…but I can’t – if you know it please share. As I was watching the show, I thought the idea of Redneck Tacos (A) sounded delicious, and (B) would be a really fun dinner to serve my family. Basically, the “tacos” take all the classics of BBQ food and serve them together in one dish. The base of the dish is a cornbread pancake, topped with shredded BBQ meat, and finished off with a big heaping serving of coleslaw…and it works. It all comes together and tastes great, plus it is a fun way to mix up your weeknight dinners. 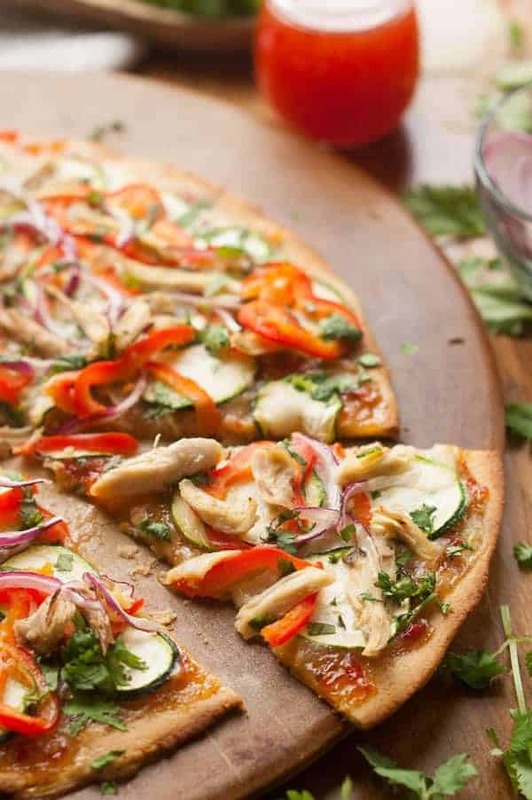 This recipe is also made with wholesome ingredients, without refined sugar and no heavy sauces. 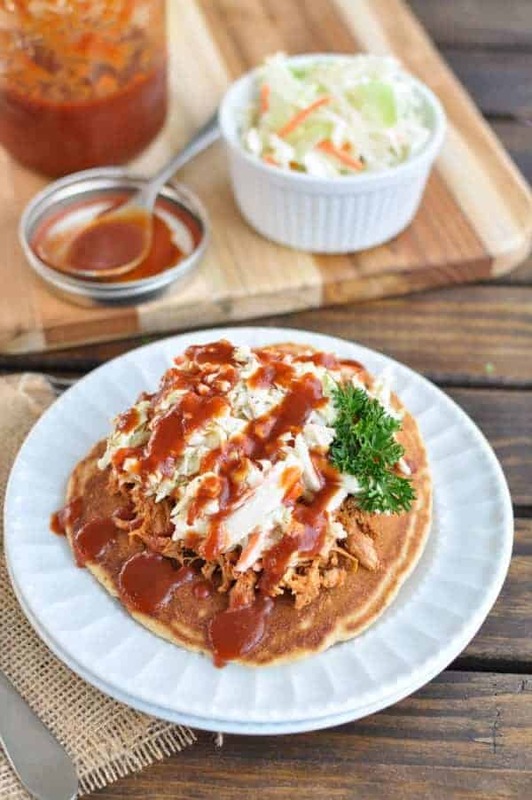 I used whole grain spelt flour and cornmeal for the pancakes, my healthy homemade BBQ sauce for the meat and topped it off with my Greek yogurt coleslaw. It really was a fun and different way to incorporate healthy foods into our dinner menu. Costco actually has pulled pork that’s pre-cooked and Clean. I don’t think it’s the best to eat plain. Using it for something like this is really convenient. This is a good way to change it up and make it better and it works really well. The same thing goes for pulled pork leftovers. 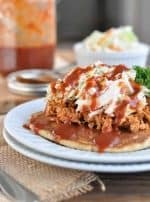 To make your own pulled pork, it’s really as simple as putting a pork roast in the crockpot on high for 8 hours with a cup of so of BBQ sauce on it. I would love to know how these turn out for you. Please comment below and let me know what you think! 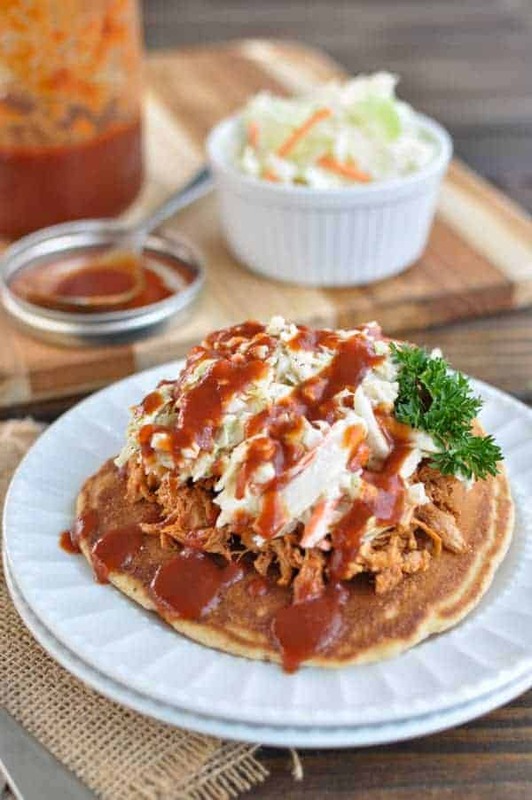 Once the cornbread pancakes are cooked, top with shredded meat and BBQ sauce, add coleslaw on top, and drizzle with extra BBQ sauce. I always wondered what Redneck Tacos are too. I have to try there now! Now I know what Redneck Tacos are….so glad I do! They look delicious and totally like something my kids will adore. Can’t wait to make. Pinning!